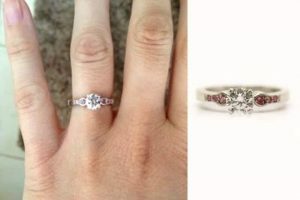 I love seeing our engagement rings, dress rings and wedding rings in real life. Most of the rings that we make evolve from an intensive design and consultation process. Sometimes, a customer and I will work together for weeks, maybe even months, to get the design details right. Likewise, sometimes it’s a long wait for the perfect gemstone or diamond to come along. 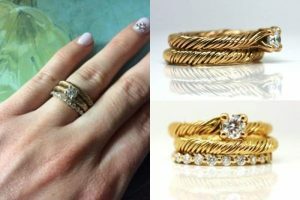 The rings we make are often surprises, so it is important that the lifestyle, taste and finger type/size of the intended recipient is the focus in the design process. It’s gratifying to see that the end result is both well received and perfect for the wearer. 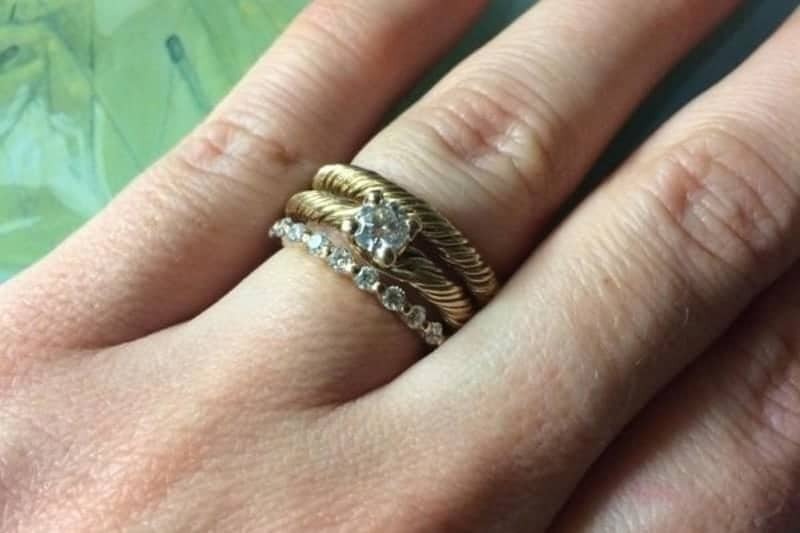 The most frequent comment I get when the customer receives the ring is how much more beautiful (or delicate) it is than it looked in the photo. 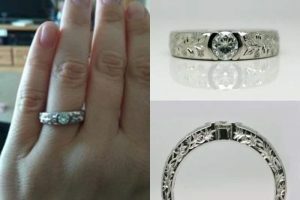 There is such a difference between seeing an image of a ring photographed alone in a light box and seeing it in person. Photographs (particularly, my not terribly skilled ones) somehow just don’t tell the whole story. Their apparent size can be overwhelming; or the details are so magnified that the subtlety is lost. It is when the ring is finally on its finger that the magic happens. It’s a thrill to receive a photo from a customer and to be able to share a little bit of the joy of the ‘big moment’. 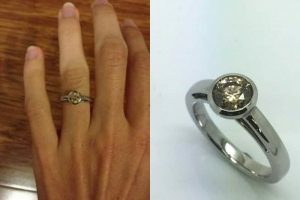 The following images of engagement rings on fingers are a mix of those supplied by customers of Ethical Jewellery Australia and some taken when the ring was collected in person. 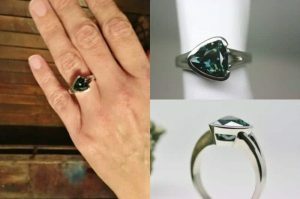 They have been paired with photographs of the rings (taken either by myself or Ferdinand – one of our fabulous jewellers) on their own to show unseen details and to illustrate the difference without a hand to give a sense of scale. The photo quality varies greatly as these images span quite a few years. This Argyle cognac diamond is surrounded by a detached halo set with Argyle white diamonds. The ring is made with recycled platinum and was created to celebrate a very special birthday. This ring is a lovely take on the classic four claw solitaire Design. As you can see, the wedding ring matches, as does the diamond eternity band. The metal is recycled 18 carat yellow gold and the diamonds are from the Argyle mine in Western Australia. Hers features Argyle diamonds in a recycled palladium embrace style setting. Likewise his is recycled palladium with a custom engraving. This interesting ring was named after the pineapple top inspired under-carriage pattern. It is made with recycled platinum and features synthetic rubies and white diamonds from the Argyle mine in Western Australia. You can read more about this ring here. This gorgeous (and flawless) 78 point Argyle pear diamond is claw-set in a recycled palladium and is matched with a fitted wedding ring. 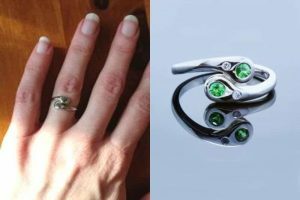 This petite bypass style was made in recycled platinum and features a tsavorite garnet and Argyle white accent diamonds. Here we have a half bezel recycled palladium with a 5mm round moissanite and custom engraving. This is one of our most popular ring styles. More beautiful Argyle diamonds – a 70 point white diamond is flanked by 8 point pink hearts and 1.3 point rounds in recycled platinum. 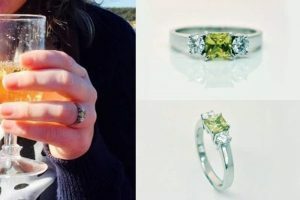 This trilogy style (past/present/future) ring is made with recycled platinum and features a Queensland yellow sapphire flanked by Argyle diamonds. This popular embrace style ring is made with recycled platinum and is set with a Central Queensland parti sapphire. 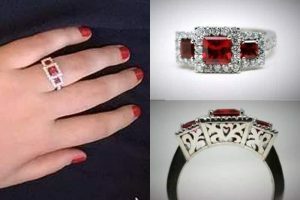 The ring also features fair trade rubies and Argyle diamonds. 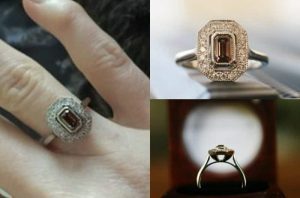 The customer supplied central diamond in this ring is bezel set. EJA supplied the Argyle shoulder diamonds. The ring was made with recycled platinum and features milgrain edging and custom engraving. Here you have another Queensland parti sapphire, this time set in heart shaped claws and accompanied by bead set Argyle diamonds in the shoulders. Once again the ring was made in recycled platinum. This ring is what’s called a detached halo style. It features shoulder diamonds, milgrain edging and rondelles. The ring is made with recycled platinum and the diamonds are from Argyle. 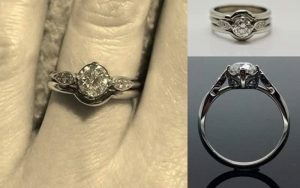 This engagement ring was made to match a favourite, very old market fine silver ring. 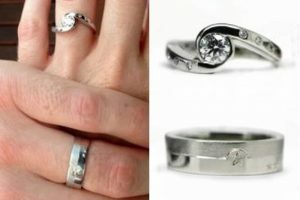 The leaf wedding ring was shaped to match. The rings were made in recycled platinum and feature 5 and 2 point Argyle diamonds. The non-hand shot just shows the engagement ring. This vintage-inspired ring in recycled palladium with Argyle diamonds and a shaped wedding ring. It has an unusual compass point orientation for the setting of the main diamond and the under-carriage is very intricate. The ring is shown here with matching wedding and eternity bands. This simple and elegant bezel solitaire features an Argyle cognac diamond in recycled palladium. This is another of our popular styles that we often embellish with engraving and milgrain edging. This large trilliant (3.18 carat/8.9mm) shaped parti coloured sapphire is from the Central Queensland gem fields. It is set in a recycled platinum semi bezel. A gorgeous locally cut, unheated, blue sapphire from the Glen Innes region in NSW with diamonds from the Argyle mine in Western Australia. The ring was made in recycled platinum and features milgrain edging and engraving. A beautiful fair trade sapphire from Malawi, mounted in a four claw recycled platinum setting with Argyle diamonds on the shoulders. 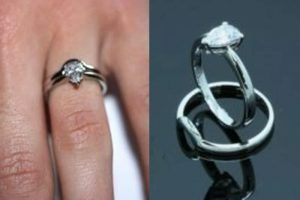 These are just a small selection of our handmade engagement rings. You can see more of our sold pieces in this gallery. 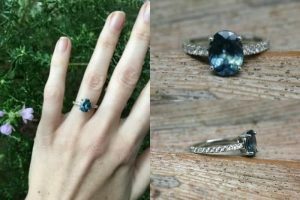 Engagement and wedding rings (and more) are custom made to order using ethically sourced and processed diamonds and gems and recycled metals. Designs are customer driven and we offer you as much support through the design process as you need. Price is a common question – it is difficult to be specific as it can change with finger size, metal type and diamond/gem specifications. However, there are general guides here.